This week, in a peaceful community in Cross River State, an anomaly occurred. A vivacious young man committed suicide. It’s an anomaly because Nigerians are not known for suicides. Our propensity to hope is matchless. 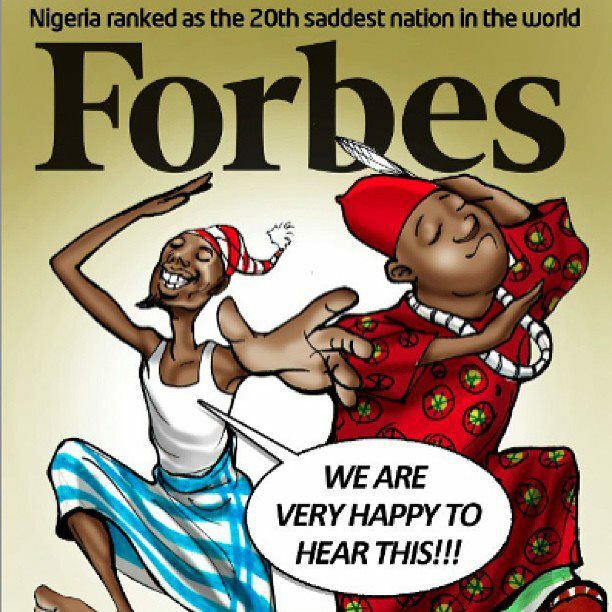 A recent poll ranked Nigeria as the “most positive country”. How then do we now have a suicide on our hands? The story appears quite simple. Boy and girl are posted to the same state for the mandatory national youth service. Boy meets girl in the orientation camp (November 2014). They fall in love (or think they do). Boy thinks of marrying the girl. The girl travels home and returns with an engagement ring—“we can still remain friends”. Boy feels bad enough to end his life (February 2015). It’s quite a sad tale. The first reaction of many Nigerians is to blame the young man for his “stupidity”. “How can he kill himself over a woman?” “There are many women out there”. “There must have been something wrong with his head”. “Maybe they were following him from the village”. Ask any Nigerian what the last statement means. It is understandable for many Nigerians to have such reactions. Here is a very religious country with lots of hope to spare. In the midst of acute suffering, the average Nigerian says, “It is well”, possessing the firm belief that, “One day e go better”. Nigerians can smile in the midst of real torment. That’s how resolute we are. If Japan, America and some European countries had half as much problems as Nigeria has, their suicide rates would be worse than current levels. Before we castigate the young man, and “re-kill” him for his act, let’s pause and ponder a bit. Why would a young man, brimming with energy, having just completed a bachelor’s degree, and having a whole life ahead of him, with vistas of opportunities, decide to kill himself because he was spurned? Does it make any sense? Could there be something else that we are not seeing? Someone said we are good judges of others, and good lawyers of ourselves. Without the holier-than-thou blindfold, we may actually see that the guy was seriously depressed. I doubt that that his depression started with his being spurned. More likely, the rejection was just the tipping point that pushed him over the cliff. Hooke’s law, used to model the elasticity of various materials, states that strain is proportional to the applied stress. This holds true until a point called the yield point is reached. Beyond this point, even a little increase in stress would create a much larger disproportionate amount of strain, and at the “ultimate tensile strength” the material would break. Relating this to the matter at hand, the young man must have faced several events that added to his depression. Those quantum leaps worsened his situation as time went on. Finally, his elastic limit was reached and he could not take any more. DISCLAIMER: I am neither a psychologist, nor am I offering medical advice. I believe that communication is key to dealing with depression. We need to be able to talk with people facing depression, and have them willing to talk. However, how would they talk freely if our words, actions and body language show that we would condemn them if they were to tell us of their problems? An adage says, “A problem shared, is half-solved”. If someone facing some problems has people he/she can be free with, it would go a long way in helping such a person. The listener would be able to offer meaningful advice, or direct the person to someone else—maybe more experienced, a psychologist or other professional caregiver. Communication is one important condiment that is not emphasized in many Nigerian families. Many children face bullying in school, but find it hard to tell their parents about it. They end up building a hard shell and sinking deep into it. Many siblings and friends also do not do “proper” (or meaningful) communication. Apart from discussing the latest fashion trends, gadgets, or music videos, they do not talk about “important” issues. If we can communicate more, signs of depression would be spotted early and cases of depression would be nipped in the bud. I have talked about better human – human communication to curtail depression. Now, as a Christian, let me talk about human – God communication to handle depression. John 14:27 says that God gives peace that differs from the world’s peace. The kind of peace that stays calm in the midst of a storm. Any atheist or non-Christian should pardon my foolishness. I believe that God can help anyone facing any form of depression. There is hope that comes from knowing God, faith-driven hope that assures one that there is light at the end of the tunnel. If you know someone that is depressed, you can advise that person to try God. He works! While the ever-busy inhabitants of the earth go about their daily activities, many persons struggle with problems that depress them. With each unhandled problem, these persons sink deeper into depression. We cannot get the young corper back, but with better communication, propelled by a bit of love, we can help prevent the net suicide. We can help nurture a society of emotionally stable individuals. All it takes is a little concern. PS: As at the time of writing this article, the young corper’s death was officially recorded as a suicide. I spoke with a youth corper who had firsthand knowledge of the case. As with several suicides, the Police may later find new evidence, and reopen the case as a murder investigation. This would however not detach anything from the proliferating cases of depression, and the need to help those facing depression.